There’s no denying that summer is rapidly approaching. And one of my all-time favourite summer accessories is sunglasses! 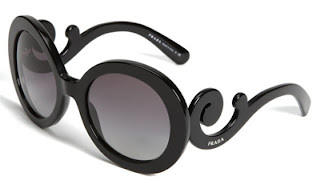 Never have I been obsessed with a pair of sunglasses.. until I saw these: the Prada Baroque sunglasses. These sunglasses truly are a work of art. I love the swirls at the side, they are somewhat reminiscent of the wavy Chanel glasses in 2007. The Prada Baroque Sunglasses cost €210, but fortunately I have found an alternative. Check it out below. Just click the image to shop! As gorgeous as the Prada glasses are, they are a bit out of my price range. You really won't get anything closer to the original Prada Sunglasses than these gorgeous shades from baginc.com. The baginc.com sunglasses come in red, white and leopard if black is not for you. The sunglasses below cost €7, a steal in my opinion. Wow, what a fantastic find! Me encantan estas gafas, son preciosas.